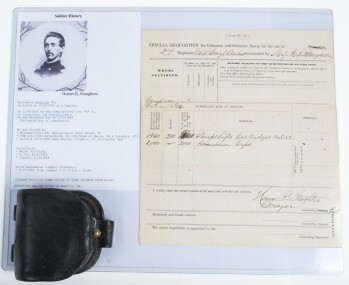 This is a special requisition signed by Homer R Stoughton. He is asking for 1,460 Sharps rifle cartridges and 2,000 percussion caps. Stoughton was from Vermont and led the Sharp Shooters at Gettysburg. This documents fits into Berdan, Sharps, and Ordnance collections. The lot also contains a Union cartridge holder that is authentic to the Civil War time period.